There are many ways to get involved with Act of Giving. As a starting point, you may wish to attend an event to meet us and learn more about how we implement our mission. Upcoming meetings and events are listed on the Events page. 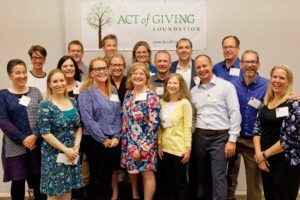 Being involved with Act of Giving is a great learning opportunity for those who are inspired by teamwork, researching nonprofit work, and a commitment to social change. There are no limits to what you can contribute and learn. Thanks in advance for your interest! If you are interested in joining or just making a donation, your tax-deductible donations can be made in a few different ways. In order to be eligible to be considered a member and vote for proposals, membership dues must be received by the 4th Monday in March of each year. Any donations received after this date will count towards membership for the next voting year. 1) You may donate via PayPal. Just enter info@actofgiving.org as the recipient and include your interest level and contact info the comments. If you have a linked bank account to Paypal you won't be charged a fee. 2) Get in touch with us at info@actofgiving.org and mail a check to Act of Giving at 2226 Eastlake Avenue #168, Seattle, WA 98102. Contribute funds of any dollar amount. With Act of Giving, financial gifts are greatly maximized because our organization is volunteer based. Junior Member ($120) For voting members 18 years of age or under. Voting membership in Act of Giving is based on a personal and/or fundraised contribution on an annual basis. Members may vote on grant proposals and administrative issues. At this level, members may submit grant proposals reflecting nonprofits they wish Act of Giving to financially support. This level also votes on all grant proposals and administrative issues. For donations of $1,200 or more a year is for members that want to see bigger grants given to the proposed organizations and comes with full voting and proposing privileges. If you're looking for a place to make that big donation, look no further.